IDEF (International Defence Industry Fair) is a specialized fair which is open for professional visitors related directly and indirectly with the defence industry. With over 800 exhibitors from 50 countries, 133 official delegations and almost 66,000 visitors expected, IDEF is the largest exhibition area in Eurasia Region, organized biannually under the management and responsibility of the Turkish Armed Forces Foundation. At IDEF is exhibited the state-of-the-art in the fields of land, naval, aviation defence, security, maritime and aerospace industry. Our purposes of the visit are: see the innovations, obtain new business ideas, reach the prominents of the sector, meet our existing and potential customers and increase the cooperation opportunities by making direct contact with the procurement/supply/R&D departments of the participating companies and delegations. 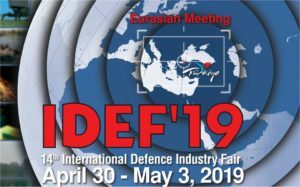 IDEF 2019 will take place in Istanbul, from April 30 to May 3, 2019. See you there!